A party planning and crafting blog to inspire your inner party diva. My daughter Yvette is a talented baker-in-training. Over the last couple of years, her skills in the kitchen have ALMOST reached my own. Open the photo album and peel back the cardboard on the inside cover, making sure not to rip it apart from the inside binding. Do the same to the backside cover. Cut the fabric to fit around the outside covers of the album, leaving a 2″ inch border of fabric over the edges of the album. Spray adhesive to the exposed edges of the fabric as well as the outer border of the cardboard cover. Fold over the 2″ fabric edge and smooth out any wrinkles. 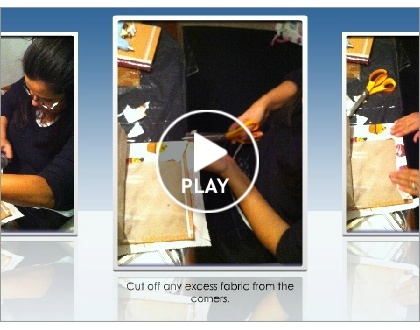 Cut off excess fabric with scissors. Spray adhesive to the cardboard cover you peeled away and smooth over the fabric edges you folded over so that they are sandwiched underneath the cardboard cover. Pencil in the design you wish to paint on the cover of the book, then use fabric paint to fill in the pencil outlines. Let dry for an hour. Finally, insert a few of your own favorite recipe cards and leave the rest of the album pages blank so the recipient can complete the book with their own recipes.